You are currently browsing the daily archive for September 13, 2018. Fast forward to the present: Obama started his mid-term campaign for the Democrats on Friday, September 7, 2018. The nation’s first African-American president ripped Trump for his response to the violence at a white nationalist rally in Charlottesville, Virginia, last year. “We’re supposed to stand up to discrimination,” Obama told an audience at the University of Illinois’ flagship campus in Urbana-Champaign. Signaling a more direct engagement in get-out-the-vote efforts ahead of the November elections, the former Democratic president took credit for the booming economy Trump loves to tout even as he warned that the nation is at a dangerous crossroads. “You need to vote because our democracy depends on it,” Obama told the crowd. The speech is Obama’s first major foray into politics as Democrats scramble to win back control of Congress in the midterms. Speaking to a packed auditorium with about 1,100 students, faculty and community members, he said young people are coming of age during a time when the powerful and privileged are pushing back on America’s ideals. The solution, he said, is not the purported resistance movement inside the administration that is working to thwart Trump’s worst impulses, as described by a senior official who this week wrote an anonymous New York Times op-ed. Obama said that’s not how democracy is supposed to work. The Gateway Pundit exposed Obama’s claims (emphases in the original). 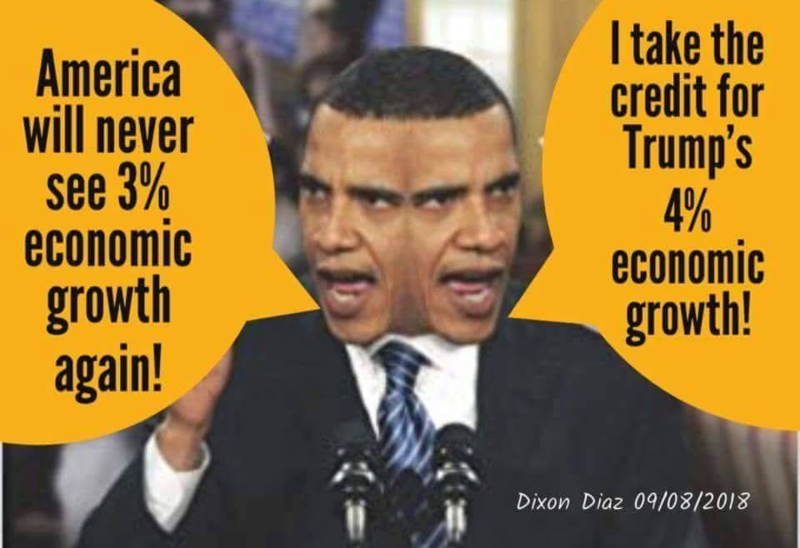 Truth: Obama was the first president in history to not have a single year of 3.0% GDP growth. Truth: Obamacare covered 21 million but 28 million Americans remained uninsured. It was a failed government boondoggle that ruined US health industry. Truth: The last Bush deficit was over $400 billion. Obama immediately increased the deficit by a trillion dollars. It was at $600 billion when he left office. Truth: Manufacturing jobs are up by 400,000 under President Trump. Obama lost 303,000 manufacturing jobs as president. Let us look at the presidents’ respective track records — and other aspects of Obama’s speech — in more detail. In his first 600 days, in spite of increasing interest rates and the massive debt that he inherited, President Trump’s debt increase is around half that of Obama’s ($1.5 trillion). The Benghazi Committee set out to investigate why four Americans died in Benghazi September 11, 2012, not to damage a presidential candidate. Rightly or wrongly, their credibility has been called into question, including by statements from fellow Republicans. In 2009, BRIAN STELTER wrote a New York Times op-ed saying that Obama treated @FoxNews as "political opposition." 95-year-old Jakiw Palij — the last known Nazi collaborator living in the United States — at his home in Queens, New York, and deported him to Germany. Trump’s ambassador to Germany jumped on the issue straightaway, pointing out that Obama himself did nothing. Oh, the irony! Obama is speaking out now because he’s panicking. The high-level, penetrating corruption of his administration is slowly seeing daylight and he desperately needs a distraction. Expect more of this as the damning facts continue to come out. “You didn't build that… somebody else made that happen!" -Says the jackass who is trying to steal the credit for Trump’s record-breaking economy. This country is sick of you. Obama needed his words thrown back at him. Glad to see someone did so.